Since antiquity, artists and architects have relied on regulating lines and mathematical ratios to guide the proportions and arangement of their work. The use of these techniques helps a composition 'look right'. 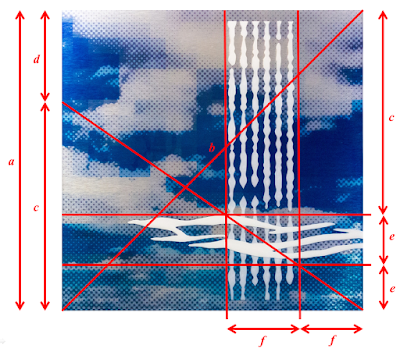 There are many different geometric compositional systems such as the golden ratio or the rule of thirds. In this case we are starting with a square image and will therefore use a ratio of the square root of two: the ratio between the diagonal of the square and the side of the square. Besides helping to guide a balanced composition, these mathematical relationships add one more layer to these layered images!